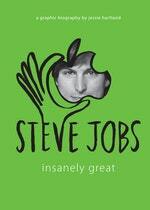 This biography in graphic novel format is at once stylish, irreverent, and smart—like Steve Jobs himself. This biography in graphic novel format is at once stylish, irreverent, and smart—like Steve Jobs himself. Presenting the story of the ultimate American entrepreneur and perhaps the most influential individual of our time, this unique and groundbreaking book is sure to appeal to the legions of readers who live and breathe in the techno-centric world Jobs created. Jobs’s remarkable life reads like a history of the personal technology industry. He started Apple Computer in his parents’ garage when he was twenty-one years old and then molded it into the world’s most valuable business. He became the tastemaker of a generation, creating products we couldn’t live without while revolutionizing the music, phone, and tablet computer industries in the process. Capturing his unparalleled brilliance, as well as his many demons, Jessie Hartland’s innovative biography illuminates the meteoric successes, devastating setbacks, and myriad contradictions that make up the extraordinary life and legacy of the insanely great Steve Jobs. Love Steve Jobs: Insanely Great? Subscribe to Read More to find out about similar books.